Police officers in Tobago will get ‘ethics’ training to bring their customer service up to an ‘international’ standard to deal with community crime, and the coming of Sandals. So announced acting Senior Superintendent Jeffrey George after residents of Mason Hall complained last Wednesday about a spate of robberies and beak-ins which they say have been plaguing the village for two years now. The residents blamed an increase in criminal activity on poor customer service and dishonesty from officers at the Mason Hall Police station. Speaking at a police town meeting at the Mason Hall Community Centre last Wednesday, George said he was awaiting approval from Police Commissioner Gary Griffith for the training programme. “Sandals is coming in and we, the Tobago police officers, need to step up our game, and we have enough time to work on that. “We need to start to deliver on an international (basis), so we must improve on tourism policing and community policing,” he said. “We need your help also. We know these complaints are the height of unprofessionalism, what we can do is prevent that from happening to another person,” he told residents at the meeting. 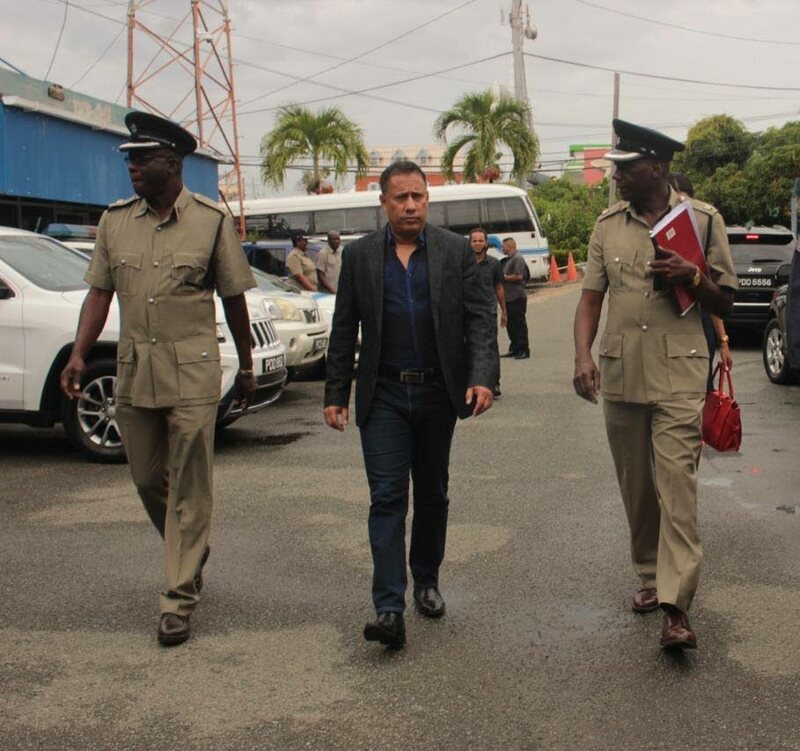 Assistant Senior Superintendent Sterling Roberts, after listening to the residents’ complaints, promised action against corrupt police officers at the Mason Hall police station. Roberts, describing the villagers’ complaints as very disturbing, promised to take action against the officers. He said members of the public should contact senior officers if they were not satisfied with the manner in which their reports were being handled at police stations. Resident Jocelyn Dennis, of Northside Road, said she was dissatisfied with the treatment from officers at the Scarborough and Moriah police stations after reporting a break-in incident at her home. “My neighbour's son keeps breaking into my home and sleeping in an unoccupied downstairs apartment for some time now. The officers are neglecting me and my complaints. When I do what I have to do, the young men in the area send threats to me and sometimes beat me up. I want to live in my house in peace,” said Dennis. Resident Junior George also complained about an unknown person who he said keeps breaking and entering his apartment building. “They going in, leaving their garbage and using the washroom and leaving it dirty. I could go there and catch that person, but I might get myself in trouble by doing the police work. I went to the police to report it, they told me they would call, no one called,” said George. He said officers promised to deal with the matter on several occasions but to date nothing has been done. “I have a tenant whose money was stolen when someone broke in. The police came and never got back in contact with the tenant. Now we have to ask ourselves, when we go to make a report, will we even get any type of back up or feedback? Can we even depend on officers…? George spoke about another incident where he said his life was threatened by another villager. He complained that officers at the Mason Hall police station deal with the matter in an un unprofessional manner when he attempted to have it resolved. Horace Martin, Belmont Road, first praised some officers at the Mason Hall station who he said would make regular checks at his business place. He then complained about unfair treatment and dishonest actions by other officers. Martin, a senior citizen, suggested the behaviour of the officers was due to a lack of enthusiasm in conducting their duties. “I was in an accident with a policewoman who was clearly wrong. When I went to check up on the case, I was told the case was thrown out My wife got robbed in our garage. People who heard about it saw fellas known in our area buying expensive things you know they don’t have the money to buy. Martin, who said he was also robbed at gunpoint and assaulted in another incident, said he was called into the Moriah police station do an ID parade but then was told it was cancelled because there was an issue with the holding cell. Resident Lousandra Roberts said she was annoyed at how the justice system was lenient on bandits. “When a young man is found with a gun, not a pen or something that will help them better themselves, they are given a little slap on their hands by the magistrate and released. We can’t tell the magistrate what to do but it’s time something be done to scare bandits away from criminal activities,” said Roberts. The residents said trust between officers and villagers would help deal with instances of crime, and they also called for an increase in police patrols at night to lessen robberies. They said loitering was a big problem and recommended that criminals charges be brought against deviants and fines meted out for them to do community service. Reply to "‘Ethics’ training for Tobago police"